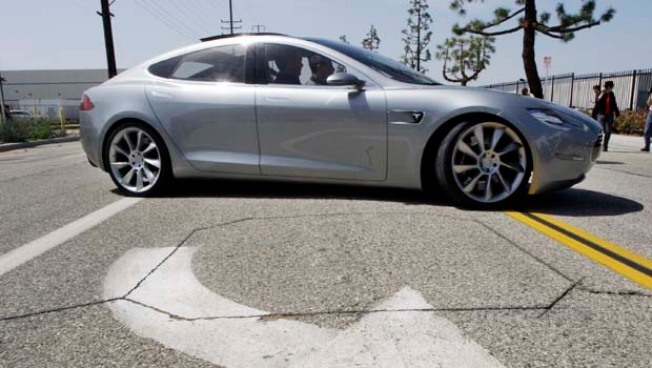 The long awaited Model S from the Bay Area's Tesla Motors is unveiled in Southern California. Take a sports car, add a dollop of Bruce Wayne and a generous helping of James Bond, and you might have an idea what it's like to drive the Tesla Roadster. The $109,000 electric car, unveiled in 2006, is impressive by any conventional measure. Years later, the two-seater is still one of just a handful of electric vehicles on the road that can hold its own alongside any gas-powered challenger, and it is by far the flashiest of the bunch. 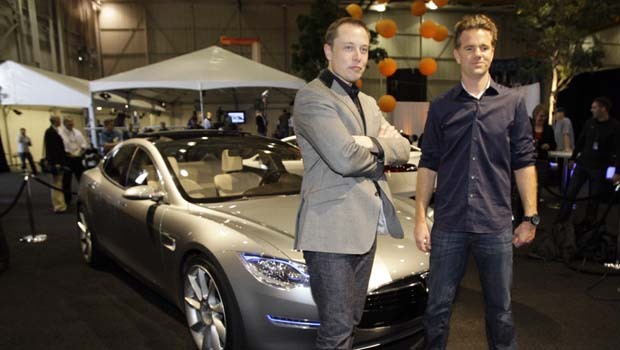 Tesla Motors hoped to garner more acclaim Thursday as it unveils the Model S in Los Angeles. The car presented Thursday is a "working prototype" driven only by company engineers. It's electric sedan that will target more practical buyers and potentially transform the San Carlos company from a fringe player to a mainstream automaker. The earliest you could fork over the $50,000 to own the Model S, after accounting for a $7,500 federal tax credit for electric vehicles, is 2011. At Thursday's event, it was announced the vehicle would be built in Southern California. Tesla's road has not been easy. Tesla's Roadsters carry a steep base price of $109,000, limiting the car's appeal. The company said it has delivered more than 250 of the cars and has about 1,000 customers on its waiting list, all of whom have put down deposits. Valleywag is reporting that Gov. Arnold Schwarzenegger wants to terminate his Tesla Roadster and that he has been trying to return it for months. Tesla admits it is not making money on the venture. Last month, Chief executive Elon Musk said the company secured another $40 million in financing from its investors, putting it on track to become profitable by midyear. Whatever the future holds for Tesla, the Roadster offers a glimpse of what's likely on the horizon for an auto industry that is increasingly going electric. The first thing to note is that the Roadster is not a car for most people, or even your typical Porsche enthusiast. It is a car for technology buffs who relish being on the cutting edge. So for venture capitalists and Silicon Valley chief executives, the Roadster does manage to seamlessly blend raw power of a racing machine with the green sensibilities of zero tailpipe emissions. The car is powered by a massive lithium-ion battery pack -- the same technology in laptop computers and cell phones -- composed of 6,831 individual cells. The battery, weighing in at about 1,000 pounds, is so big it takes up most of the car's rear half. After a four-hour charge, the car has a range of about 220 miles, explained Joe Powers, the company's northeast sales manager, though this varies based on how it's driven. Because of the battery's weight, Tesla went to great lengths to trim mass elsewhere, he said. The exterior, for example, is made of carbon fiber, which adds to the cost but saves about 300 pounds, bringing the car's total weight to about 2,700 pounds. Like many high-end sports cars, the low-slung Roadster hugs the ground. Nonetheless, the ride is astoundingly smooth and quiet. The interior is austere, if a bit cramped. The silver gear shift has just three settings: drive, reverse and neutral. In place of a fuel gage, a small, lighted bar indicates the car's charge, and two numerical displays estimate the car's remaining range based on an average-use calculation and also how you're driving at any given moment. Like the Toyota Prius, the Roadster has a regenerative braking mechanism that helps improve mileage in city driving. Tesla makes the notorious claim that its 248-horsepower motor accelerates the car to 60 mph in under four seconds. The Roadster is a flashy ride, to be sure, and the cherry-red press model attracted a good deal of pointing and open mouthed stares, not to mention a police car that followed me for several blocks.